As we know, in any given year, the playing field isn’t exactly even. It’s just one of those things that we quietly accept, because there’s not really much of anything to be done about it. The hope just has to be that, over time, things more or less balance out. (They don’t, at least for teams in the AL East.) For 2014, as for all seasons, the playing field won’t be even. I already took a look at this by projecting divisional WAR. 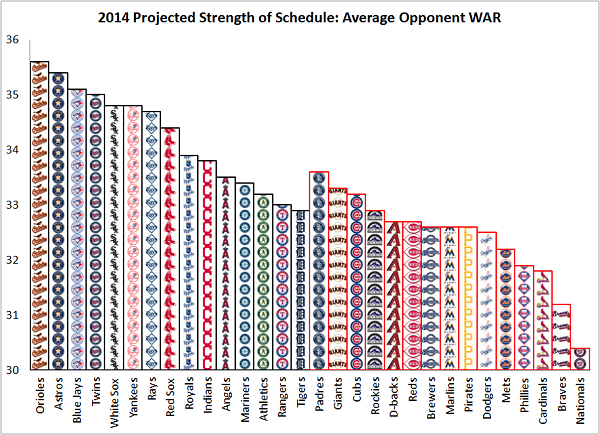 But that can still be taken to the next obvious step — team-by-team projected strengths of schedule, also by WAR. See, some teams will play easier schedules, overall. Some teams will play more challenging schedules! The effect is relatively small, compared to just levels of talent, but at the extremes it can make a difference of a few wins. Which means it can make a difference between a playoff spot and not a playoff spot, or a protected pick and not a protected pick. From the divisional post, one could already kind of work out the toughest and the easiest schedules, but I thought I might as well just calculate the breakdowns. I pulled all the schedules off of MLB.com and put them into a spreadsheet. I gathered all the team-by-team projected WARs, as of the moment, and normalized them so that the sum came out to 1,000. For each team, I subsequently calculated the projected average 2014 WAR of their opponents. Here are the results, split by league, with the AL on the left and with the NL on the right, outlined in red for some reason. The Orioles have the toughest schedule overall, with an average projected opponent WAR of 35.6. The Tigers have the easiest schedule in the American League, with an average projected opponent WAR of 32.9. The Padres have the toughest schedule in the National League, with an average projected opponent WAR of 33.6. The Nationals have the easiest schedule overall, with an average projected opponent WAR of 30.4. The differences are small. The differences should be small, or else something would be severely broken. But remember, these differences are on a per-game basis, and each team is going to play 162 times, give or take one or two, so there can be a more significant effect. The Orioles will share the AL East with three really good teams and a team that ought to rebound in the Blue Jays. The Tigers will share the AL Central with a couple of borderline pushovers, and, importantly, the Tigers will never have to play against themselves. That’s the part of this that goes kind of unspoken: the worst teams don’t get to play the worst teams, and the best teams don’t have to play the best teams. This right here is one of the reasons a lot of people believe the Tigers have the clearest shot at the playoffs out of the gate. In the National League, there’s hardly any separation in the middle. Between the fourth- and the 13th-ranking schedules, there’s a projected WAR difference of 1.1. All the way to the right, though, are the Nationals and Braves, who will share the NL East with one tough opponent and three fairly mediocre opponents. Obviously only one of those teams can win the division, but when it comes to determining the Wild Cards, the NL West is deep and for that reason it puts the teams at something of a disadvantage. It’s slight, but so will be the difference in record between the worst playoff team and the best non-playoff team. It’s up to you to decide how much you care about this. It’s a lot easier to just pretend like the schedules basically even out because then you can just concentrate on the baseball. Yeah, WAR misses some stuff. Yeah, teams are going to change, and there are going to be injuries and transactions, and Kendrys Morales and Stephen Drew and Ervin Santana won’t be free agents forever. Like all projections, these are guesses, and guesses come with error bars and an understanding that they can end up way off. But I don’t think you can really disagree with the conclusions from the graph above. Not today, not given the current MLB landscape. The landscape could change significantly, unpredictably, in the future, but then that’s the exciting part. We hoped you liked reading 2014 Strengths of Schedule, Projected by Jeff Sullivan! 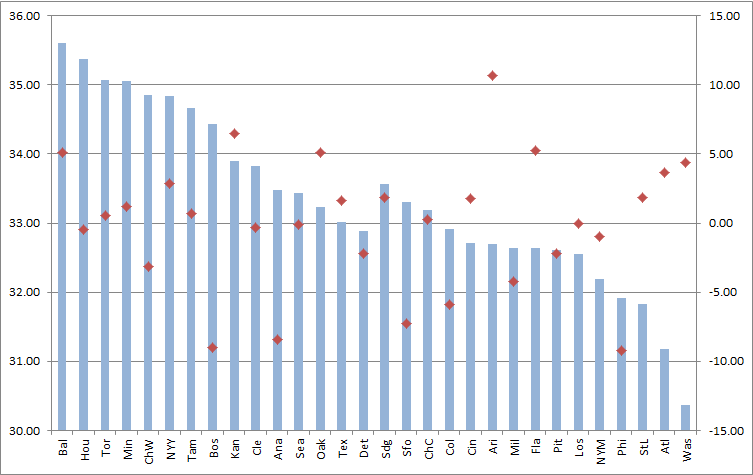 Taking the same data, but added points to show the variation in home/away schedule. The red diamonds show my calculated* advantage for the home/road splits, where positive is better. Home/Road split averaged 0.550/0.450 from 2006-2010, so if the game was away the value was adjusted to match. Then I took that value times 162 to show the effect over a season. A positive value means that if you compare the base WAR-SOS to my aWAR-SOS, the team has an easier schedule. I would not take those numbers to mean that Baltimore will win 5 more games this year because of an easier home/road split, because I’m not sure how WAR directly correlates to wins. Perhaps Jeff can shed more light on that subject? I should make virtually no difference what a team’s H/R SOS split is in terms of their overall record. I’m not saying you’re wrong, but I disagree based on the following: If playing at home gives your team ~20% boost in winning percentage, you would love to schedule based on that. The Tigers (46) would always prefer to play the Red Sox, Rangers, Rays, Yankees, Angels, Royals, and A’s at home, and everyone else away. @JunkyMonkey I’m not sure it’s quite like that. Sure, you have a slightly higher chance of beating those teams, but you also have a lower chance of beating worse teams. Travis: It’s true that the gains from playing at home are balanced by the losses from playing on the road. But I think the idea is some teams, by luck of the draw, will get a greater share of games at home where the marginal gains will help them more whilst getting games they’ll still win despite the marginal difficulties of the road.